The International Centre for Numerical Methods in Engineering (CIMNE) is a research organisation in Barcelona, Spain. CIMNE was created in 1987 as a Consortium between the Catalan regional government and the Universitat PolitÃ¨cnica de Catalunya, with the support of UNESCO. 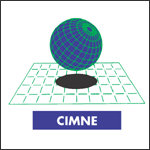 CIMNE employs some 150 scientists and engineers from different technical fields and nationalities (over 15 different countries) in the development and application of numerical methods to a wide class of engineering problems aimed to achieve positive economical and social impact with innovative technologies.